Airlines were canceling flights and waiving change fees as wintry weather threatened airports across a large swath of the United States on Tuesday. Nearly 1,200 flights had been canceled and another 1,900 delayed as of 1:20 p.m. ET, according to flight tracking service FlightAware. Of the cancellations, nearly 700 were made preemptive in anticipation of the storm. The biggest disruption came at Houston Bush Intercontinental Airport, the busiest hub for United Airlines. Nearly 700 flights had been grounded as of 12:20 p.m. local time, accounting for more than half of the airport’s entire daily schedule. Houston Hobby also was hard hit, with more than 160 cancellations there as of midday. That represented nearly 40% of Tuesday’s schedule. The city of Houston remained under a winter storm warning on Tuesday that called for ice and snow in the area. In addition to the complications from an unusual winter weather event, cold temperatures also could lead to backups in Houston and elsewhere as planes are deiced prior to departure. Travelers should brace for delays and disruptions across central and east Texas and along the Gulf Coast as wintry weather pushed deep into the region. Also seeing higher-than-average rates of delays and cancellations early Tuesday were the Austin, Dallas Love. San Antonio and New Orleans airports. Most big airlines were already waiving rebooking fees ahead of the storm. Several of the nation’s busiest airports – including those serving New York, Washington, Baltimore, Boston and Philadelphia – were forecast to get accumulating snow late Tuesday into Wednesday. That ranged from just an inch or two in Washington to more than a half-foot in New England. Flights could be disrupted both from snow and ice removal and from backups from de-icing aircraft prior to departure. 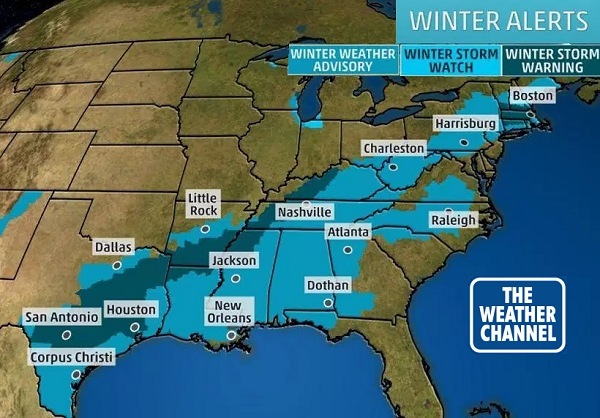 Some cities in the South were expected to get wintry weather Tuesday into Wednesday, including places like Atlanta, Charlotte, Nashville, Louisville and Richmond, Va.
By Tuesday, Delta expanded its winter-weather waiver to include more than 30 airports in Southern states stretching from Louisiana and Arkansas east to the Carolinas.